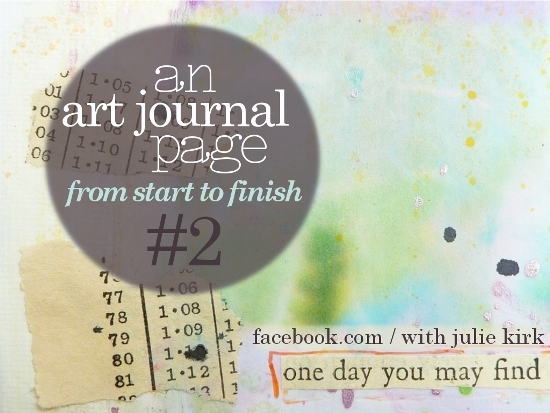 I shared my first 'Art Journal page from Start to Finish' last summer and according to my blog-stats it's been my most visited post ... which is really good to know. It's also my most 'pinned' project on Pinterest too ... so I don't think it's too much of a leap to say that somebody out there found it worth reading / useful / interesting ... so I've made another one! Here's the finished page in question, so you don't have to scoot all the way down to the bottom to see how it turns out in the end! Like all of my posts this week, today's project recycles rubbish. As soon as I saw the lovely effect the water had created ... I knew I had to turn it into a journal page! My journal is made from handmade, absorbent paper, so I wanted to 'seal' the paper a little bit ... but I'm far too impatient to coat my pages with gesso and wait for it to dry. Note the plastic glue-spreader. Again: because I'm too lazy to clean brushes. Gel medium isn't essential to this process. PVA / watered down white glue and even a glue stick would work fine too. There's just something a little bit smoother and easier to spread about the gel medium, which I like. Also, this particular one dries with a matt finish, preventing all those shiny edges and smears you can get with other glues. Just because they're 'spray' inks ... doesn't mean they always have to be used by spraying them directly on to your page. Here I spritzed some on to a non-stick craft mat, picked it up with the foam and then pressed it through the holes in the sequin waste. For the record: I'm a useless stencil-user. When you're building up less than anatomically correct bodies it doesn't mean you shouldn't assemble its various 'parts' with a little time and care. When the arms, legs, head etc are joined to one another relatively seamlessly, in roughly the right places it helps give the overall effect of creating a 'character' rather than being just some randomly scattered elements and odd parts! And that's about it for the main page elements really. There were a few final touches: a little doodling around the figure and the word strips along with a few stamped stars around the edges, but nothing major. If you've never tried art-journaling I hope this helps persuade you that it's not as complicated as you might think when you're looking at someone's completed pages. Give it a try, it's not a science, there's no possible way to get it wrong or even to be perfect at it. It's a messy, jumbly, hour of cutting + sticking and making yourself happy. Go ... enjoy! [And let me know if you do]. Drop by the shop for interesting vintage pages and images to use in your journal. That's a great description. I have a plastic wallet with thick card, blocks of paint (and BRUSHES! ), some pens, magazine pages and gluestick. I take it to work and sit in my campervan during my lunch break, sometimes doing a page or background. Just wish I had more time to art journal, but at least I have these snatched moments. Can't wait to try this technique too! I really appreciate you dropping by and leaving such a wonderful comment on my art journal page. Now I'm off to go and Pin this technique. Thanks! Thanks for the 'steps' - a very good place to start! When I've cleared my table a bit . . . . . .
great tutorial... I love it! Thanks for sharing. I'm glad I found your blog. I'm obsessed with art journaling. I'm getting lots of tips from you. Thank you for sharing.